The Blakely Rock yoga sculpture finally lost its balance. 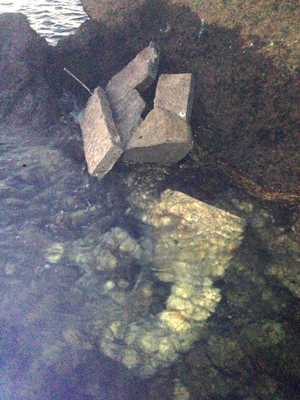 Artist Ethan Currier sent us a photo (right) of the fallen remains his 1,600-pound rock creation Monday morning. 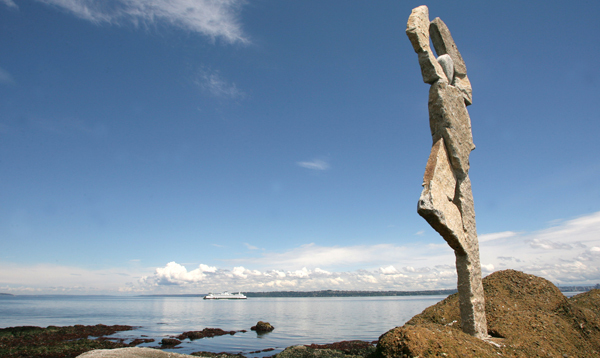 The 12-foot-tall, unauthorized public art piece had stood on the reef outside Eagle Harbor since late December. It’s unclear when or why the sculpture fell. Currier hinted at possible vandalism in his email. He said he was confident the sculpture wouldn’t have fallen on its own, and noted the weather has been calm lately. “I’m glad nobody was hurt,” he added. Currier said he planned to clean up the rubble as soon as possible. How sad. I wish he had voluntarily put it up in my yard. It would still be here. I think it’s a great piece. It looks great in that location also. I hope he does not lose his enthusiasm for art. I very much liked “Blakely Rock Man”. I will miss him on my trips past the rocks. I thought he stole some of the areas natural beauty. His act was selfish, sneaky, and an act of vandalism against the public trust.